Blood, gore, pretty women and brainless action - I like it! The plot is simple - a guy looses his loved ones and has to kill a lot of bad guys to get his vengeance. Nothing new, nothing brilliant, but not bad either. The writing is quite lame at certain points, but taking the genre into account and squinting through smoke hazed 70'ies glasses, I think it is part of the point. 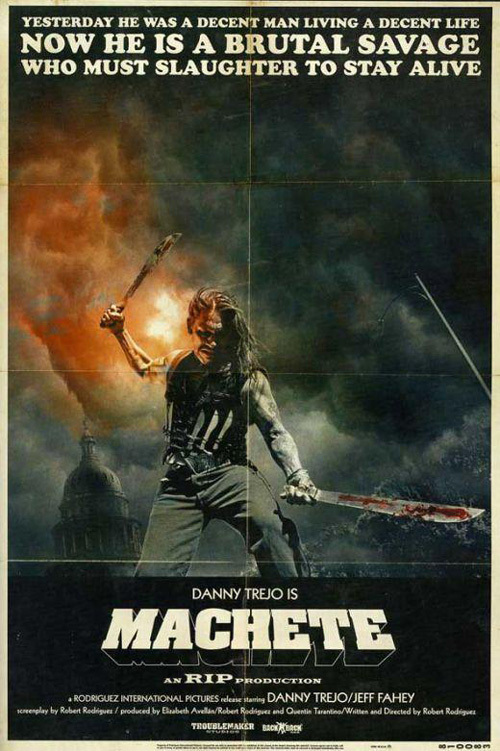 Even though I prefer Danny Trejo as a bad guy, he does as great job in this smash hit of a simple, violent movie. He does a good job playing the classic anti-hero. I have never really liked Steven Seagal as an actor, and him portraying a Mexican is just a joke. Bad acting and out of his element is what best describes his performance in this one. Robert De Niro, on the other hand, does a brilliant job playing a bad guy. He is a brilliant actor and pulls the part as a crooked politician of just perfectly. Jessica Alba playing "a woman of the law" (btw. that line really sucked!) does an acceptable job, but with the writing, she has quite a few lame lines to deliver. She is pretty though - which also goes for Lindsey Lohan. The movie also includes some of the cast from "Dusk Till Dawn" like Cheech Marin and Tom Savini. In may ways it reminds me of that movie. The level of seriousness is about the same. The effects are HIGHLY exaggerated in terms of blood, gore and splatter as wells as firepower, explosions and all engulfing flames. But who doesn't like that? All in all yet another great brainless action movie. Watch it with a friend, have a beer and a laugh. It is quite good.